Now is the season of sweet, dark berries gathered by the handful at the sunny edge of the woods. 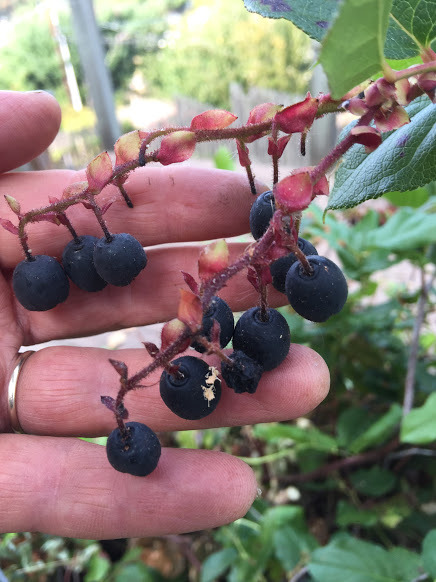 But for those of you not from Cascadia (the Pacific Northwest), I’m talking about salal berries. They’re native, humble, not well known, to my surprise, even to many Washingtonians. They are completely edible–just ask Lewis & Clark. Also delicious–although don’t expect that opinion from Lewis & Clark. They got pretty sick of salal that winter of (I think) 1804. Maybe because they were eating them dried and mixed with smoked salmon and bear grease, a protein-packed pemmican the Coastal nations were kind enough to share with them. Granted, you wouldn’t want to bake a pie with salals–at least I wouldn’t. Their skin is rough and a bit furry, like a peach, and their “meat” is seedy. I usually chew a sweet mouthful, then spit out the pulp. Hard to do that with pie. But they’re sweet! And free! And best of all, to me, unlike those giant, juicy blackberries that stop me on my bike rides–they BELONG here. 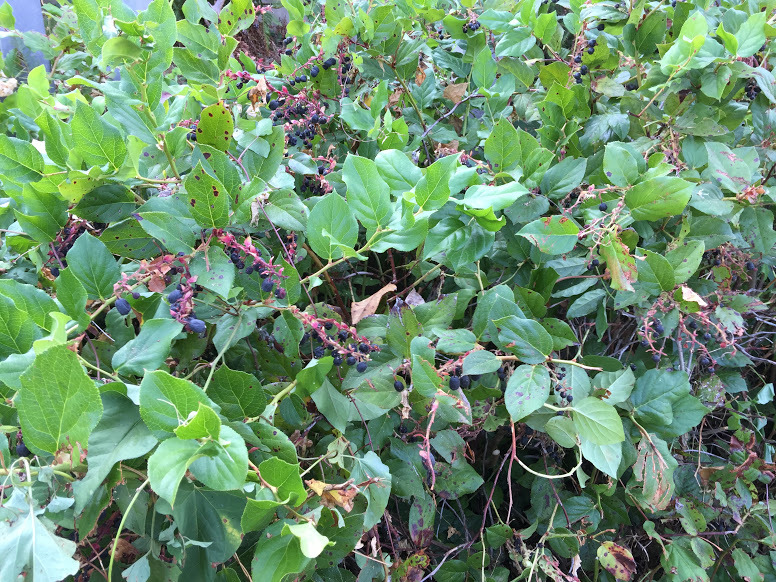 I was thinking about salals and blackberries the other day after reading my morning poem by Mary Oliver. (She has defaulted to my poet of choice since I took up the daily poem habit as inoculation against the day’s national news, after the election.) Mary had a childhood full of suffering, which she managed to transcend through her writing–and probably lots of other activity I don’t know about, since she hasn’t written an autobiography. But my point is: she suffered, she survived, she wrote, and her writing is both vehicle (to her) and Promised Land (to the rest of us and also, I devoutly wish, to her). I’m a writer. I have to this point in my life suffered almost nothing. 50-some years of good fortune. I know my time will come, so I’m neither boasting nor tempting Fate–just wondering: could this be the reason I have yet to write something that brings people screeching to a halt at the side of the road? Is my writing sweet, nourishing, but not very tempting? When someone takes a bite, do they savor, but still spit out a portion of pulp? Is suffering the sunshine and rain that causes art to plump and swell? Or does the real difference lie in the species themselves: some of us are born with certain DNA, then planted and raised in such a way to create more beauty or truth than others? I take comfort in the fact that this is, really, a pretty silly parallel. Also that I love blackberries, and great writers, so much that I’ll never waste time feeling envious. But in salal season, I still wonder. 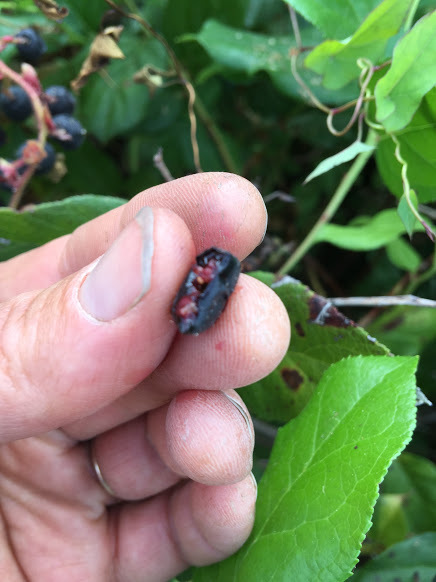 This entry was posted in Wing's Words and tagged baking, blackberries, Lewis and Clark, Mary Oliver, native plants, pacific northwest, poetry, salal berries by gretchenwing. Bookmark the permalink.